Cost to install a propane gas furnace varies greatly by region (and even by zip code). Get free estimates from air-conditioning and heating contractors in your city. Cost to install a propane gas furnace varies greatly by region (and even by zip code). ??[how_much_does_it_cost_left_part_label]?? to install a propane gas furnace??[how_much_does_it_cost_right_part_label]?? Although most people wait to install a new furnace until it is absolutely necessary, installing a new propane-fired furnace in your home is a great way to increase your HVAC system's power and efficiency while reducing your heating costs. A well-maintained propane furnace should last around 15-20 years, which makes an upgrade a powerful investment in your home. Propane is one the most energy-efficient furnace options. The required size and power of the furnace vary depending on the size and age of your home. For a 2000 square foot home, an installed propane 1 furnace averages between $3000 and $5000. 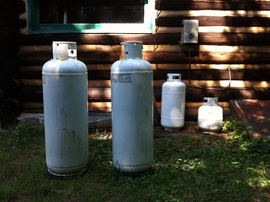 Parts: A typical propane 1 furnace costs between $800-$2000, depending on the brand and efficiency. Larger houses will require larger furnaces in the $3,000 range. 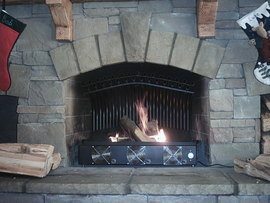 Furnace efficiency is measured by the annual fuel-utilization efficiency (AFUE) rating, measured as a percentage. The higher the AFUE, the more expensive the furnace. As a whole, propane 1 furnaces tend to have higher AFUE ratings, with average model falling in the 85%-90% range. Labor: Expect to spend $1000 to $2000 on labor costs. This cost could be higher if the existing if the heating system needs to be reconfigured to work with the new furnace or if you are switching HVAC systems from another energy source, like natural gas or electric, to propane 1. Removal and disposal: In most cases, you will need to remove the old furnace. Labor and disposal fees can run you another $600 to $1,000. Extra features may lower your monthly energy bill, but they require more tend to cost more when the furnace is purchased and installed because companies charge more for the additional features and they can be more intensive to install. Popular features include variable-speed blowers 2 that move air slower when less heat is needed and variable heat output that automatically adjusts the heat output. Additional furnace components, such as a HEPA air cleaner or humidifier, can be added to a standard propane 1 furnace. These features improve air quality and breathability but will cost an extra $400-$800 per item. Although propane 1 furnaces tend to be slightly less expensive to purchase and install than their gas or electric counterparts, maintaining the propane 1 source can be more expensive. Propane 1 prices vary based on your location and availability, but purchasing propane 1 for your furnace can be more expensive (around twice the price or more) than using natural gas or heating oil. Different types and levels of insulation can help extend the life and power of your furnace. Old or thin insulation can allow heat to escape more quickly, which works against your furnace. If you need to replace or add insulation to your home, plan to add an additional $2500 to your budget. Before spending the money to have a broken or faulty furnace completely replaced, have a specialist run a few tests to see if repairs can fix the problem. Investing in a check up could save you thousands of dollars if the current furnace can be repaired. Replacing the furnace or reworking the HVAC system requires a permit in most states. Check with your HVAC specialist for specific guidelines in your area. You may be eligible for a tax credit depending on the efficiency of your new furnace and the age of your home. Credit amounts and requirements change every year, so check with an HVAC specialist or accountant for the most recent local information. How much does it cost to install a propane gas furnace in my city? Cost to install a propane gas furnace varies greatly by region (and even by zip code). To get free estimates from local contractors, please indicate yours.